This is me with my very first dog. 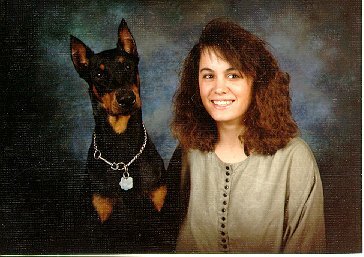 Yes, I grew up with family pets, but this was MY first dog, Dante's Inferno, and the namesake for my kennel. This picture was taken when Dante was about 6 months and I was in college. Dantero Malinois is a working Malinois breeding program. My goal in breeding is to produce dogs who have excellent working ability (drives, grips, work ethic, athletic ability, attitude, etc), health and stability, who also look like a Malinois. I would rather have an ugly dog (ugly NOT being defined as structural issues) who lived to be 16 and was an awesome working dog than a pretty dog who wasn't stable or lacked working ability. However, the entire package is the ultimate goal. A dog with the perfect blend of drives, temperament and work ethic isn't any good if it's crippled by 3 from hip dysplasia or blind at 5 from PRA. But neither is a dog who lives to be 18 without a sick day in it's life, that will bite any stranger that comes within 5 feet of it and is terrified of it's own shadow. My main activity with my dogs is the protection sports (French Ring, Schutzhund, MondioRing, etc) and herding, but I also dabble in agility, obedience, tracking, lure coursing and any other activity that comes my way and looks like it might be fun. So I want a dog who can do anything we might decide to do, have fun doing it, and do it well. I believe breeding is a balancing act. Although each breeding is done with the goal of producing that ideal dog, there might be a different "main focus" from breeding to breeding. One breeding might focus a little more on fixing a structural weakness, another on increasing the amount of "pack drive" and still another might be done to improve grips. But the overall goal of health, working ability, stable temperament and "Malinois good looks" will always be constant. Dantero Kennel has produced, and continues to produce, dogs that are successful in protection sports, police work (patrol and detection), herding, obedience, agility, border patrol, military working dogs, search and rescue, flyball, tracking, and as family protectors. Dantero Malinois have been the top dog at the Regional and National levels in French Ring, Schutzhund/IPO, herding and DiscDogs. They have also stood on the podium at the World level. Visitors to "the facility" (ie my home) are welcome, but by appointment only, and only those seriously interested in aquiring a Dantero Malinois. The dogs are my passion and hobby, not a business, as such I also have a full time job as a computer programmer to support my hobby. Between work and the dogs care, training, competing, etc I have a limited amount of free time for visits, and have unfortunately had to cut back on the “educational only, I’ve never met a Malinos and would like to come see them” visits. I still recommend people visit this breed in person before ever considering getting one, and can provide you with a list of events in your area where you should be able to see the breed in action and learn more about them. For those serious about getting a Dantero Malinois, feel free to contact me and we can arrange an appointment for your visit. I can be reached via email (malinois@dantero.com), text message or phone call (760-215-0343) to arrange a time to come by.